Ever since Grace was diagnosed with INAD, we have done our best to make as many memories as possible with her. In all honesty, we don't know how much she gets out of some things we do, but they are memories that Kyle and I will be able to carry with us for all our lives. 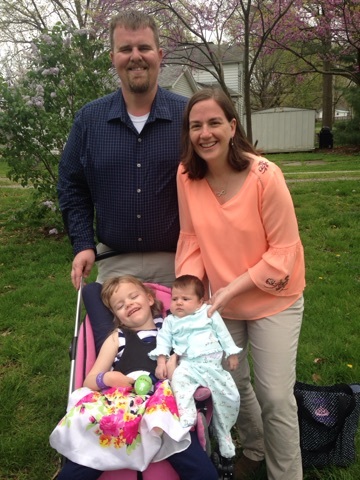 I can remember when Grace was born, we took her to the pumpkin festival at Broom's Orchard in Carlinville when she was just a month old. We dressed her in a Halloween outfit and bib, complete with an orange headband and took her to pick out her very first pumpkin. 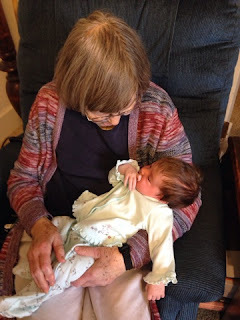 We talked about being able to bring her back when she could do the pony rides or feed the goats, excited for the time when she would be able to participate in many of the activities. Waving palm branches on Palm Sunday at church. 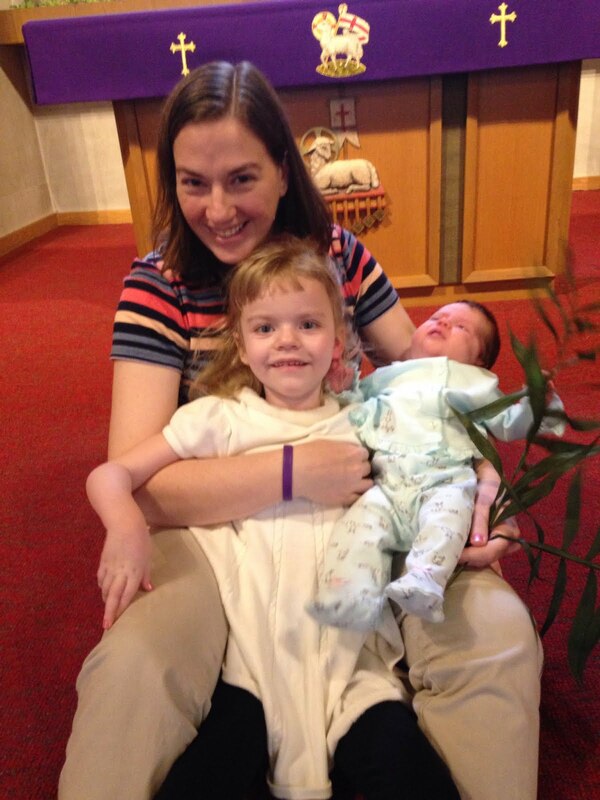 Mommy and her girls on Palm Sunday. It's a challenge at times, as it's always a big job to take Grace somewhere. 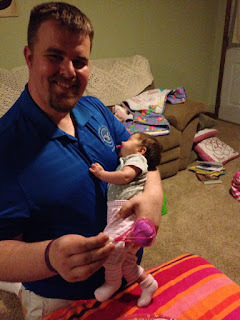 And since it's harder for her to sit up and hold her head up, I'm often not sure how much she gets out of some activities, but we keep trying! 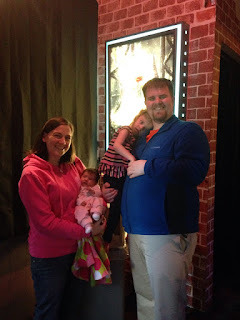 A few weeks ago, we had been talking about taking Grace to see the new Beauty and the Beast movie. I didn't want to go on opening weekend as so many people brought their little girls dressed up as Princess Belle. It's awesome to see the kids all dressed up, but it's often hard for me not to wish that could be Grace, excited to get all dressed up and go to the movies. I got to help Grace with an egg hunt at preschool. 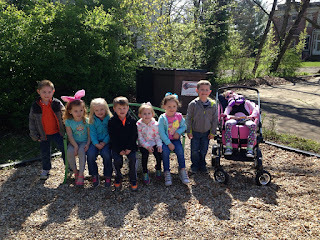 Grace and her preschool friends after the egg hunt. Being silly at her preschool party. So, we waited a few weeks until the newness wore off. In fact, we were some of the only people in the theater for that show. We picked out a couch, and Grace snuggled on Kyle's lap for the entire thing. 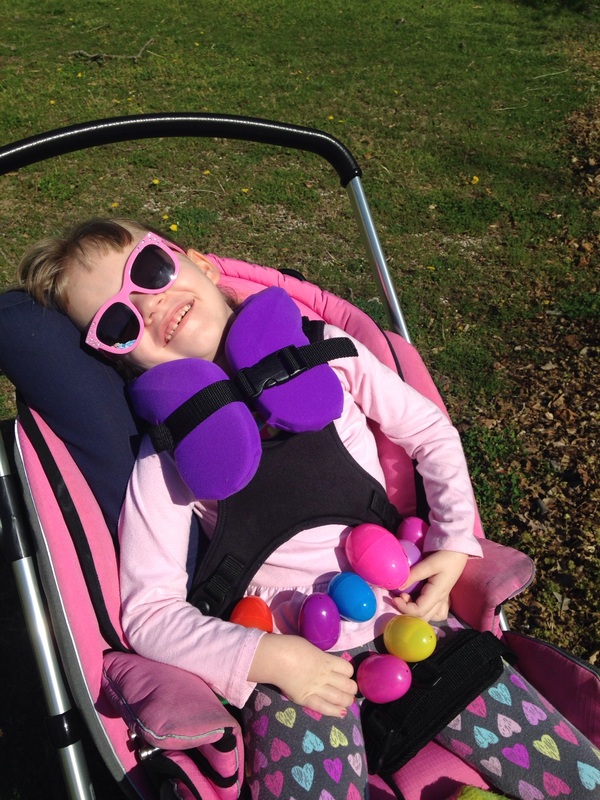 I don't know how much of it she was able to see, but she would smile during some of the music. 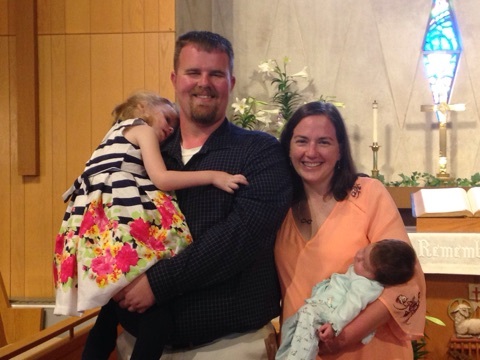 And Kyle always reminds me that Grace's very favorite thing to do, is to be with us. 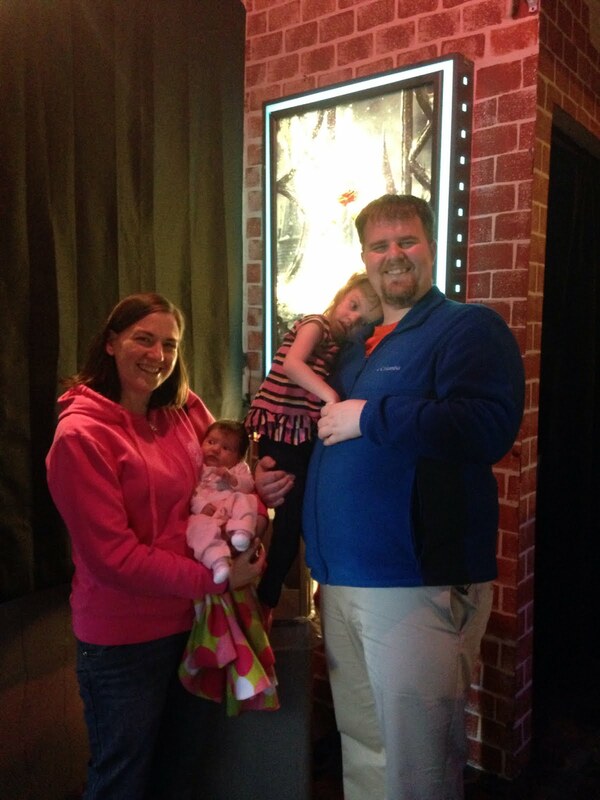 So, even though Grace probably won't remember the movie, Kyle and I will always remember the first time all four of us went to the movies together. Oh, and it was a really great movie too! 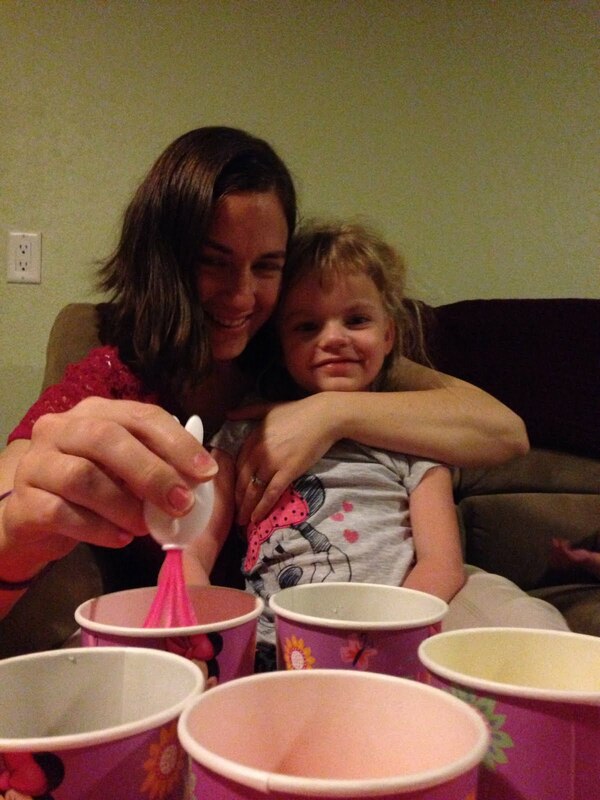 Helping Grace to color a pink Easter egg. Grace and I liked coloring eggs together. 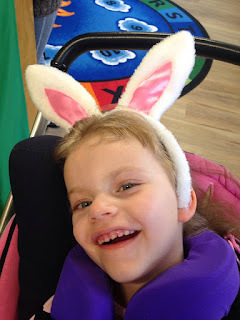 Daddy helped Charlotte dye a purple egg. 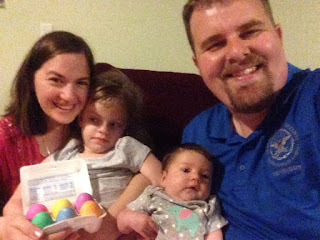 Family photo after dying Easter eggs. Holidays are another bittersweet time to make lots of memories. We love being together with our families, but it's tough at times too, just wishing that Grace has some of the same chances as other kids. But I'm always glad that everyone works so had to make sure Grace can still be a part of things. 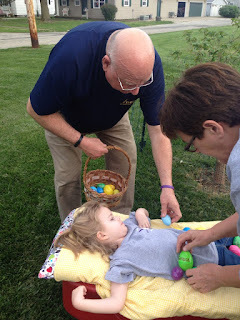 Grandma and Grandpa Galer helped Grace hunt eggs. Having so much fun with Grandma and Grandpa Galer. Mommy got to have fun with the girls too. Over the past few years, Kyle and I have let Easter egg dying get away from us. We always talked about doing it, but Grace couldn't tell us she wanted to do that, so we just didn't make time for it. This year, Kyle's Grandma Virginia gave Grace a Minnie Mouse Easter egg dying kit, as well as a whisk like device to hold the eggs when you color them. 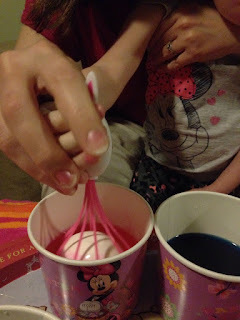 I had never seen anything like it, but it allowed us to be able to help Grace actually dye the eggs. 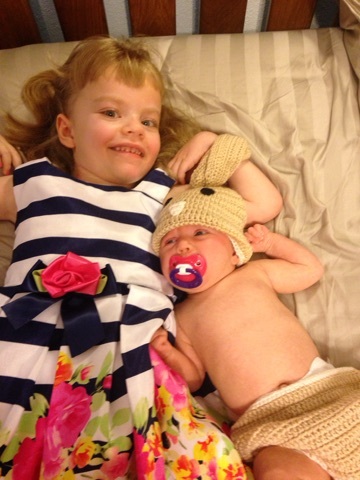 My two beautiful Easter bunnies. Although neither of us really likes to eat hard boiled eggs, we decided it would be fun this year to help both the girls color Easter eggs. Since we weren't actually going to eat them, we opted to just do six eggs, three for each girl. I held Grace's hand while we dyed eggs together, and Kyle held Charlotte while they dyed eggs. Kyle even mixed the blue and pink together to make a final purple egg. And while neither girl was super excited about it and will probably not remember it, Kyle and I enjoyed spending the evening together making memories. The next night was the annual Easter egg hunt and Grandma and Grandpa Galer's house. 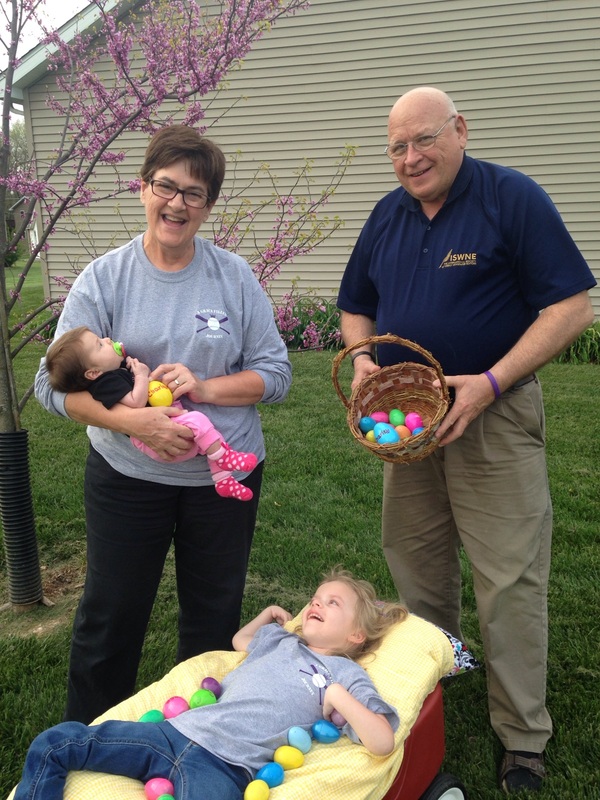 Grandpa John hid eggs in the front yard with money in them for their savings accounts. 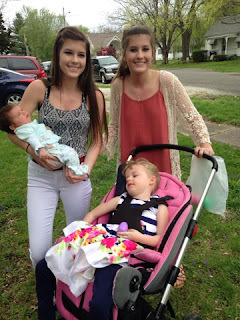 We put Grace in her wagon and pulled her around the front yard while I carried Charlotte. Dad helped them hunt the eggs. 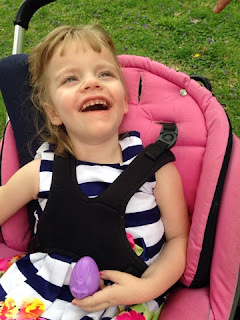 He tossed Grace's in her wagon and she would just giggle and giggle. 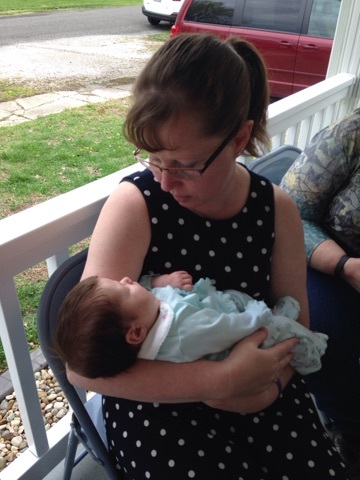 I have to say it was one of my favorite parts of the Easter weekend. 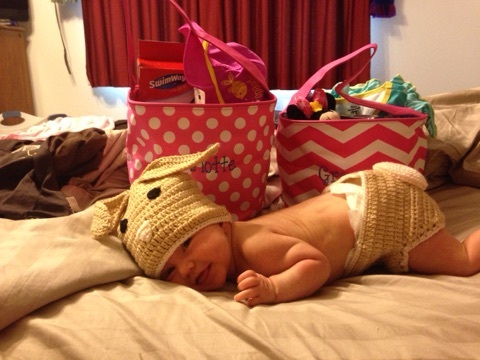 Charlotte pretty much slept through the whole egg hunt, but I managed to take a few photos to prove she was there. Charlotte meeting Aunt Kristy for the first time. 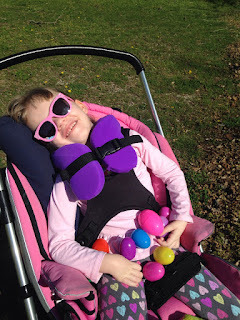 Grace found a purple egg! 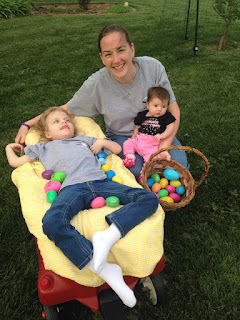 Kayley and Kensey helped Grace find Easter eggs. 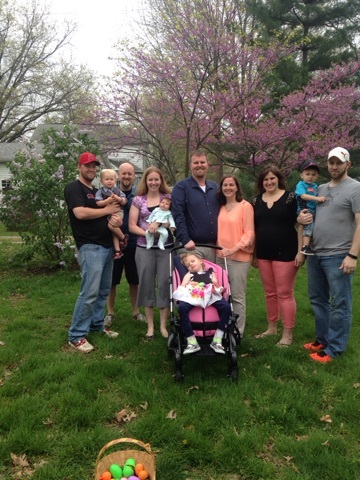 Our family on Charlotte's first Easter. On Sunday, we awoke to find the Easter Bunny had brought baskets to the girls, and I did a mini photo shoot with Charlotte in her crocheted bunny hat. Her Easter dress didn't arrive in the mail until Monday, but the girls still looked awfully cute, and I was grateful to attend church all together. After church, the Galer family met at the Ariston for a nice brunch, followed by an Easter egg hunt with Kyle's family in Raymond. His cousins, Kayley and Kensey (some of Grace's biggest fans), helped her and Charlotte hunt eggs in the back yard. There were even a few special ones just for Grace with nail polish and a bracelet from his aunt in California, since she can't eat the candy. I'm not sure who had more fun, Grace or the girls. 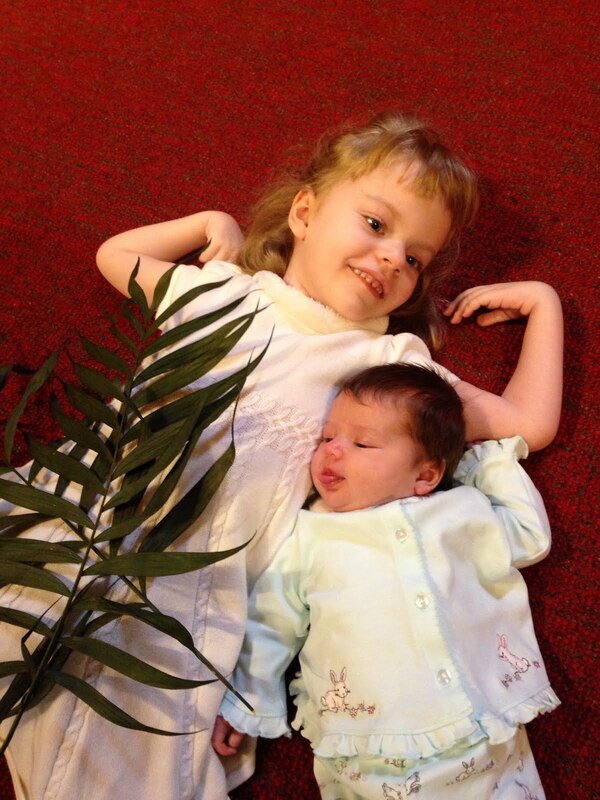 We definitely had a chance to make a lot of family memories over Palm Sunday and Easter weekends. Neither of my girls will probably remember any of the things that we did, but I'll always know that we were together. And even though Grace can't participate in some of the activities herself, I'm so grateful for those who help her experience those things. Because trust me, they are things I will always remember!